At that time, Polish security researcher Dawid Golunski of Legal Hackers who discovered these vulnerabilities published technical details and proof-of-concept exploit code for the first bug only and promised to release details of the second bug (CVE-2016-6663) later. One is the previously promised critical privilege escalation vulnerability (CVE-2016-6663), and another is a new root privilege escalation bug (CVE-2016-6664) that could allow an attacker to take full control over the database. Both the vulnerabilities affect MySQL version 5.5.51 and earlier, MySQL version 5.6.32 and earlier, and MySQL version 5.7.14 and earlier, as well as MySQL forks — Percona Server and MariaDB. The more severe of the two is the race condition bug (CVE-2016-6663) that can allow a low-privileged account (with CREATE/INSERT/SELECT grants) with access to the affected database to escalate their privileges and execute arbitrary code as the database system user (i.e. ‘mysql’). Once exploited, an attacker could successfully gain access to all databases within the affected database server. 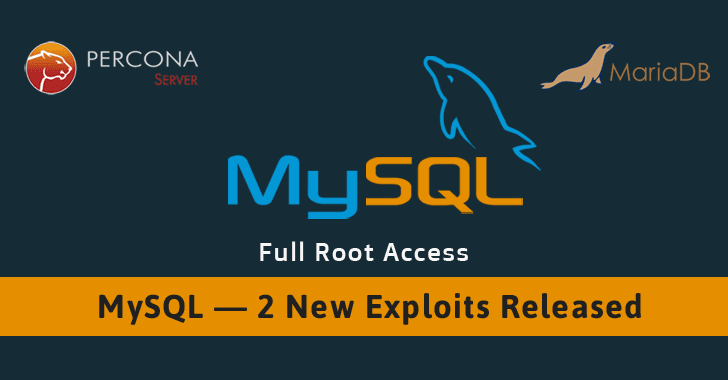 Another critical flaw in MySQL database is a root privilege escalation bug that could allow attackers with ‘MySQL system user’ privilege to further escalate their privileges to root user, allowing them to fully compromise the system. The issue actually stems from unsafe file handling of error logs and other files, which comes under MySQL system user privileges, allowing it to be replaced with an arbitrary system file, which opens the door to root privileges. What’s more troublesome? An attacker with a low-privileged account can also achieve root privilege by first exploiting the Privilege Escalation flaw (CVE-2016-6663) to become ‘MySQL system user’ and thus allow attackers to fully compromise the targeted server. All these vulnerabilities could be exploited in shared hosting environments where users are assigned access to separate databases. By exploiting the flaws, they could gain access to all databases. Golunski has published the proof-of-concept exploit code (Exploit 1, Exploit 2) for both the flaws and will soon upload videos. MySQL has fixed the vulnerabilities and all of the patches ultimately found their way into Oracle’s quarterly Critical Patch Update last month. Administrators are strongly advised to apply patches as soon as possible in order to avoid hackers seeking to exploit the vulnerabilities. If you are unable to immediately apply patches, then as a temporary mitigation you can also disable symbolic link support within your database server configuration to this setting — my.cnf to symbolic-links = 0 — in an attempt to protect yourself against cyber attacks.